In a recent study on promoting women to full professor by Georgia Institute of Technology sociologist Mary Frank Fox and cultural studies and literature professor Carol Colatrella, most faculty members could identify the list of expectations for tenure. However, fewer faculty could identify the list of expectations for promotion from associate to full professor. Because an institution may not establish straightforward expectations, promotion to tenure is based on vague criteria. One finding is that the time to reach tenure is longer for women than men, especially women at research-intensive institutions. Why? University of Pennsylvania education researcher Laura Perna's analysis of National Study of Postsecondary Faculty data find entrenched institutional practices may be disadvantageous to women. Mission statements of e.g., higher education, give clues to values revered by that institution. Mission statements may emphasize education, research, and public service but often do not list the weight of their value. At research-intensive institutions, research seems to be the only one that matters, although all involve time commitments. In a recent study by Misra, Hickes Lundquist, Holmes, and Agiomavritis (January/February 2011 issue of Academe, Vol. 97, No. 1. ), men are found to be more protective of their research time than women. Women devote more time to teaching, mentoring, service, and bridge-building at their institution. These worthy activities may be valued by the woman but they are less-valued by the institution in terms of promotion. So where does change need to be made? When applying for a job, seeking tenure, and/or seeking promotion to full professor, one should ask for the weighted percentages of what is considered worthy by that institution. After all, impact to the field via service, teaching, and policy may be less-valued or not valued by that institution. Also, women need to be more protective of the research time if they are at an institution that seems to only value research. Or, if a woman values her service and teaching, then she may wish to move to an institution that values her impact to her field. In my opinion, if more women moved to institutions that valued their impact, women are likely to lead happier lives and be promoted in equitable amounts of time. In her Keynote Address to the MIT150 Symposium Leaders in Science and Engineering: The Women of MIT, Professor Nancy Hopkins presented a wonderful summary of the reasons why there are so few women faculty in science and engineering, especially at the top ranks. She summarized not only her own experience but that of most women faculty members. Had male faculty members experienced the same systematically inequitable treatment, research universities would be under investigation by Congress for discrimination. Unfortunately, as Professor Hopkins points out, the percentage of female Senators is less than the percentage of female faculty members in science and engineering at MIT. That we face broader societal issues is no excuse for ignoring these problems in academia. Universities and other employers that pay attention to equity will outperform ones that do not. Indeed, as a department head I am delighted to see the benefits of gender equity accrue to my institution. I strongly urge readers to watch Professor Hopkins’ speech at the above link. Here I summarize her analysis of the obstacles overcome and those remaining before women face a level playing field in academia. Prior to the Civil Rights Act of 1964 and the implementation of affirmative action regulations in 1971, universities regularly barred women from the faculty. Such remarkable scientists as Mildred Dresselhaus, Cecilia Payne-Gaposchkin, and Barbara McClintock all faced this now-illegal discrimination. But the legal system and the women’s movement of the 1970s did not eliminate all forms of discrimination. Sexual harassment was, and remains, a serious problem. Professor Hopkins told her own stunning story. Unfortunately, I know from service on the Committee on the Status of Women in Astronomy that sexual harassment is not fully eliminated even today. Astonishingly it is present in some highly ranked programs. Today it is possible to gain remedy in the courts; however the effort required is onerous. Universities and other organizations should not wait for lawsuits and should not merely proclaim policy, but should investigate and discipline harassers. The American Astronomical Society has an anti-harassment policy that is laudably clear on this point. A second obstacle has been the lack of mentoring. Faculty members are not born; they are made. Professional athletes have trainers; corporate executives have coaches; faculty members also benefit from guidance beyond the research apprenticeship of graduate school and postdoctoral studies. This is especially important for faculty in underrepresented groups who have few role models. I’m proud to be at a university whose women took the lead in faculty mentoring 20 years ago with the MIT Mentoring Booklet. Mentoring performance is now evaluated as part of our faculty promotion and tenure review. In my department it is a component of the annual salary review for all faculty members. Still, mentoring is not universally valued and remains low-hanging fruit for institutional advantage. Universities and other employers that mentor their employees will outperform ones that do not. A third barrier is the work-family dilemma: how to be a parent (or otherwise have a personal life) and a faculty member at a research-intensive university. It is still falsely presented as “a women’s choice” by some: whether to have children or to become a faculty member. Universities must do more to lower that barrier because we need to train and advance the best available young people, most of whom want to have children. Simply arranging for a campus daycare center is far from adequate, as the years-long waiting lines and lack of affordable child care for graduate students and postdocs makes clear. This is a big issue requiring far more attention. After all the efforts made to overcome the first three barriers, there remain two obstinate challenges: unconscious bias and marginalization. Unconscious bias arises when both men and women undervalue the contributions of women. Every year I read reference letters – even in tenure cases – where a woman is described as “nice and personable” (or compared solely with women!) 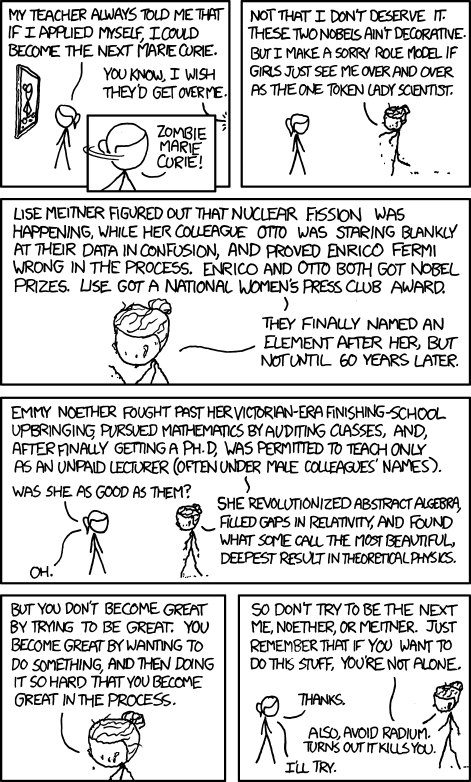 instead of being judged on her scientific contributions. Every year women are overlooked for awards because nominators tend to think of people like themselves and they undervalue the contributions of those unlike themselves. Even women tend to undervalue other women. These biases are measurable and can be corrected (see, e.g., Project Implicit), but only if we are made aware of them. The problem of marginalization is, sadly, an illustration that even conscious bias has not been entirely eliminated. Women at all levels continue to receive comments from men that “you’re here because of affirmative action.” Recently I heard this from senior faculty at a highly-ranked physics department. I hear it all too often from female graduate students and even undergraduates. I have been in department leadership for a decade and never once during this time have I seen anyone admitted or hired because of affirmative action. Such claims are false – as Professor Hopkins showed, a higher percentage of female than male full professors of science at MIT are members of the National Academies. Marginalization of any group must stop; to the extent that it creates a hostile work environment, it may even be illegal. Professor Hopkins then described the efforts MIT made to correct these problems and the remarkable progress resulting from the changes. This is very good news. The improvements in the university for everyone – and especially for women – have made her (and me) optimistic that full equity in research universities may come in our lifetimes. Yesterday we held a panel discussion during the Boston AAS meeting entitled "Transforming Cultural Norms: Mentoring and Networking Groups for Women and Minorities". In order to more widely disseminate the ideas and resources shared during this discussion, I'm taking advantage of our blog conversations. Thank you to all those who attended and contributed to the conversation. We were very pleased to see the mix of men and women in the audience, although there's definitely work to be done in engaging more senior men in these discussions. In this first post, I'm providing our extended community the resources page distributed at the start of the disucssion. Please send me your comments for any additional resources that you'd like to see included. The final list will be published for posterity at the CSWA 'Resources' page. My next post will provide the videotape we made of the discussion. As a teaser, I'll note that our discussion yesterday highlighted examples of concrete steps to take to enable sustainability, obstacles to be aware of, how to develop allies through making it clear the ways your program champions your institution's priorities, acknowledging the realities of needing to work within existing structures, and the limitations of our recent decadal survey with respect to accomplishing the goals of the 'State of the Profession' white papers. Till that's posted, another big Thank You! to our panelists for their ongoing efforts to improve the culture and climate at their institutions and for their thoughtfulness in considering the questions we had composed prior to the session to help guide the discussion. Keep in touch and tuned in to future blog posts containing additional resources and information with regards to this ongoing discussion. Recently, we have been going through a round of milestones in the lactation room in my building at NASA Goddard Space Flight Center. It is hard to believe that three first birthdays will have been reached by the end of May. These three women are myself, an associate division chief in science and an engineer. Just as a reminder, it really is the case that the World Health Organization recommends nursing to two years. I read the register each day (we sign in so the center knows how much the room is being used). We write down our “code numbers” (what science or engineering division we are in) so I can see who is in planetary science, who is in astrophysics, who is in project management/engineering. We also have three women with young babies using the room right now too. The message board is filling up (the old style of message board that involves a marker!). I find myself rooting for the newcomers. It is also added positive peer pressure for me; if I can keep this up, it will show them they can do it too. Remember, 100 years ago, before formula was widely used, it was the case that all babies were nursed, and generally they did this for at least a year (Baumgartner’s book Mothering Your Nursing Toddler points to historical data indicating that the natural age for weaning is after the second birthday). In those days, you would have had ample opportunity to discuss breastfeeding and would have had encouragement from people around you to make sure your child was nursed. Having that kind of support among your peers is of course important. I know these women are facing similar workplace challenges to me. Mission schedules can be crazy. Travel periods can be intense. They keep coming back to the room to ensure their babies get the milk and so do I.
NASA GSFC management made the decision to install a lactation room in every new building a few years ago. We are up to 12 rooms at the center. These rooms exist because employers are to provide a place (other than a bathroom stall) where we can pump milk and thankfully NASA GSFC took that responsibility very seriously. This is fantastic recognition for the value of nursing babies. I am grateful that this room is available. There is a hospital-grade pump which is much better than my pump. I have easy access to a sink to wash my hands and a refrigerator where I can store the milk. There is a microwave for sterilizing bottles (there is a nice kind of microwave bag on the market for this). You can even store pumping supplies in the room so you don’t need to remember to bring everything with you. I can use the time to check my email and have even donated an iPhone charger to the room to make sure my down time is minimized. Our room (in the planetary science and astrophysics building) is extra comfortable since we have a champion, Anne Kinney (director of the planetary science division). She put in a nice chair and some decorations and takes visitors on a tour of the room (when not in use of course!) to encourge others to install similar rooms. I’ve had a lot of support in my choice to nurse my daughter, and I would say that the availability of this room and the day-in-day-out examples I see in other women using it has been near the top of the list of "essential" support. By the way, this is a good time to remind scientists to send me their stories about nursing well past a year (Ann.Hornschemeier AT nasa.gov, as soon as possible!). Next month’s post will be a synthesis/compilation of those. The NSF ADVANCE program funds a wide variety of initiatives at institutions to increase the representation of women in STEM. I have heard of and even participated in a number of ADVANCE programs: FORWARD to Professorship career development workshops at Gallaudet University, Rice University, and University of Maryland-Baltimore County, Distinguished Scientist Lecture Series at University of Arizona, the STRIDE faculty recruitment toolkit from University of Michigan, Horizontal Mentoring (a.k.a. peer mentoring), and those are just the ones I can think of off the top of my head. These ADVANCE initiatives can be terrific resources for both women looking for advice and resources, and for institutions and department looking for ways to improve diversity. In the past, I've found that it can sometimes be difficult to find specific resources because each ADVANCE awardee has its own programs, some aspects of which are duplicated elsewhere, but other aspects which are unique to that institution. There are some real gems of ideas in there if you have the patience to look through them. Recently, I discovered that the ADVANCE program now has a web portal! It's now one-stop shopping for looking for ADVANCE websites relevant to your topic of interest. If you look at the initiatives link, you find a categorized list of the kinds of initiatives the various ADVANCE programs around the country have. One thing that stuck out to me, though, was that since most of the ADVANCE awardee sites are universities, they tend to focus on either faculty or students. One of the biggest leaks in the pipeline is the jump from postdoc to the tenure track, so there's something to be desired there. Still, if you look you can find resources for postdocs also. And now that there's this portal, it's less work to find them! Giving invited talks is an important part of any scientist’s career. It is an opportunity to sell his or her science topic in a long format and to a large audience. Yet, it seems that the same small subset of (mostly older male) scientists is asked to give invited talks at almost all the meetings. As a female physicist that has been in the field for more than 10 years, I have only been asked to give 2 invited talks. I took this personally. Perhaps I wasn’t a good enough speaker or my science topic wasn’t that interesting. Within the last year, however, I have sat on three different scientific organizing committees and those experiences gave me a different perspective. For the first committee, I was out of town when the call came for suggestions of invited speakers. When I returned and read my email, I was dismayed to find that all the suggested invited speakers (> 20) were male. Another (female) committee member spoke up and suggested diversifying the list. In the end about 10% of the invited speakers were female for the conference. For the second committee, I responded to the call for suggestions for invited speakers with 8-10 names. I tried to suggest people in a range of ages and a mix of male and female. When I didn’t know a good speaker on a certain topic, I called my colleagues for suggestions and challenged then to name both male and female possibilities. Other committee members also submitted lists of potential invited speakers (primarily male). The chair of the committee then began to invite a subset of the potential speakers without additional input from the committee members. I noticed that even though > 10% of potential speakers were female, only male names were making their way onto the final invited speakers list. I had to speak up and request that we include females on the invited speakers list. On the last committee, I followed the email exchange on invited speakers closely without participating. Without fail, every name suggested by both male and female committee members was male. In the end, I suggested two female speakers. -Don’t expect only the female colleagues on the committee to suggest female names.